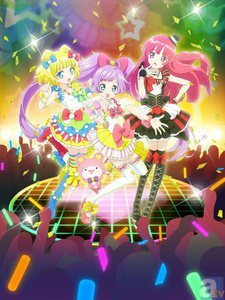 The anime is set in the PriPara world, filled with girls' dreams and yearnings for fashion, dance, and music. Seemingly every day, there are auditions that send top idols to worldwide fame on television and online. Laala and her friends are all fascinated with this world. However, Laala's school prohibits PuriPara for elementary school children. An unexpected chance leads Laala to make her first entrance into the world of PriPara, where she just might make her debut. PriPara Movie: Mi~nna de Kagayake! Kirarin Star Live! An average anime with great potential if given the chance.